The truck wars continue in 2019 with the redesigned Ram and General Motors heavy-duty models. Ram HD is first to reach the four-digit torque with the reworked Cummins inline-6 turbodiesel while updated Ford Super Series comes with the new 7.3L gasoline V-8 engine, new 10-speed transmission and upgraded Power Stroke diesel. GM presented also the all-new Chevy Silverado HD and its counterpart 2020 GMC Sierra 2500/3500 HD are also new from the ground up. The new generation of GM’s heavy-duty trucks is again distinguished by unique styling while sharing improved structure and powertrains. The new GMC Sierra HD including 2500 and 3500 models comes again in various cab and cargo bed options and there will be different trims options with unique styling for each to choose from. The new GMC Sierra, as well as the twin Chevy models, introduce a new 6.6-liter V-8 petrol-fed engine and new 10-speed automatic transmission. The diesel unit stays at the current power and torque ratings but GMC HD increased the towing capability greatly. Buyers will also love a new off-road-focused AT4 version. The redesigned GMC Sierra heavy-duty comes with impressive tech assortment including the ProGrade Trailering system. There will also be well-appointed interiors with the new tech features including also the high-luxury Denali trim. 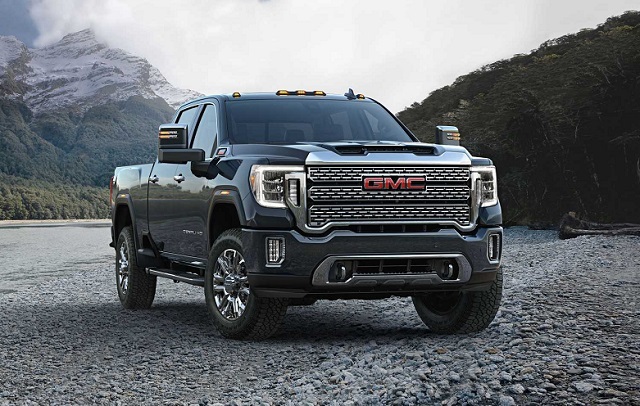 The redesigned 2020 GMC Sierra 2500/3500 HD comes with the improved ladder chassis mostly made from the high tensile steel intended to provide better performance and towing capability. With structural upgrades the new Sierra HD sports also some styling tweaks. General Motors worked to distinguish the styling of the GMS Sierra HD more from the corporate cousin Chevy Silverado HD. The new GMC Sierra HD has kept the squared-off lines of the front-end section but comes with the redesigned styling elements. Like the earlier redesigned light-duty Sierra, the HD modules have also a new grille style with more dynamic contours. The models have also new headlights with C-shaped signature elements and tall, sculpted hood. The profile sports re-sculpted fender flares and the rear comes with new multi-functional tailgate, redesigned taillights and step-bumper. Each trim also gets special treatment. The new AT4 trim combines black trim accepts with a black grille and body-color bumpers. It will offer 18-inch wheels by default and optional 20-inch units. The range-topping Denali trim will again define itself with the unique grille, lots of chrome, side steps, etc. The interior of the new GMC Sierra HD benefits also from the various upgrades. The models use the latest infotainment tech and provide high interior comfort and array of premium features. GMC claims also the class best front-seat headroom and legroom. The model will also use durable and high-quality materials and each trim will offer unique textures. The off-road-ready AT4 version includes leather seating and massive 15-inch head-up display. Most of the sales are again expected to go on the range-topping Denali trim which cabin gets leather treatment with contrasting stitching, aluminum and open-pore wood trim accents. The heavy-duty Sierra will go on sale in SLE, SLT, AT4 and Denali trim. The highlights will also include LED lights all around, class largest cargo bed capacity with 12 tie-downs. The models will also be available with the MultiPro tailgate that debuted on the light-duty version. The new is also the ProGrade Trailering System with up to 15 angles of view on the truck and trailer for easier towing and driving. The model will also equip active safety systems like the light-duty version. The 2020 GMC Sierra 2500/3500 HD enters the next generation with the new gas-fed V-8 engine and 10-speed automatic transmission. The Duramax diesel returns with the same power and torque ratings but paired with the new 10-speed transmission. The new 6.6-liter V-8 petrol-sipping engine has a cast-iron block with aluminum heads and forged steel crankshaft. The small block engine exploits direct injection and comes paired with the 6-speed automatic transmission. This engine outperforms the previous 6.0L V-8 gasoline unit with 401 hp and torque of 464 pound-feet. The new-generation Sierra HD returns with the proven 6.6-liter Duramax V-8 turbodiesel engine but now bolted to the 10-speed automatic transmission. Still, the power and torque ratings stay at the current levels 445 hp and 910 lb-ft respectively. 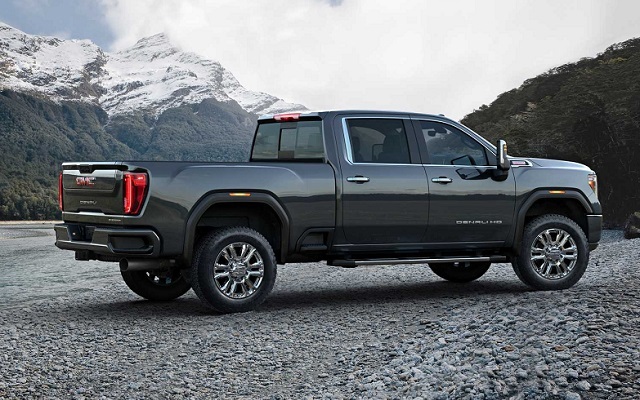 The new Sierra HD improves the payload and towing capacity significantly and its most capable configuration can tow up to 35, 500 pounds as GMC claims. The all-new 2020 GMC Sierra 2500/3500 HD will reach showrooms in the second part of the year. The price and full specs are yet to be revealed but expect the base price in high-30,000s.